The aim of this study was to investigate the association between urinary 90 kDa N-domain Angiotensin I-converting enzyme (ACE) form with C-reactive protein (CRP) and homocysteine plasma levels (Hcy), urinary nitric oxide (NOu), and endothelial function (EF) in normotensive subjects. Forty healthy subjects were evaluated through brachial Doppler US to test the response to reactive hyperemia and a panel of blood tests to determine CRP and Hcy levels, NOu, and urinary ACE. 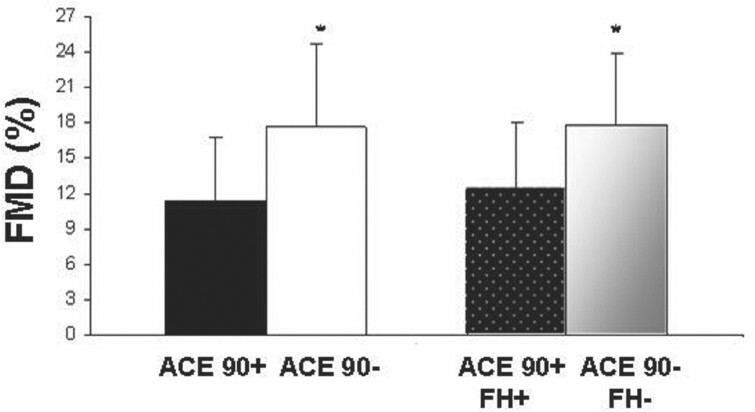 They were divided into groups according to the presence (ACE90+) or absence (ACE90−) of the 90 kDa ACE, the presence (FH+) or absence (FH−) of family history of hypertension, and the presence or absence of these two variables FH+/ACE90+ and FH−/ACE90−. We found an impaired endothelial dilatation in subjects who presented the 90 kDa N-domain ACE as follows: 11.4% ± 5.3% in ACE90+ compared with 17.6% ± 7.1% in ACE90− group and 12.4% ± 5.6% in FH+/ACE90+ compared with 17.7% ± 6.2% in FH−/ACE90− group, P < 0.05. Hcy and CRP levels were statistically significantly lower in FH+/ACE90+ than in FH−/ACE90− group, as follows: 10.0 ± 2.3 µM compared with 12.7 ± 1.5 µM, and 1.3 ± 1.8 mg/L compared with 3.6 ± 2.0 mg/L, respectively. A correlation between flow-mediated dilatation (FMD) and CRP, Hcy, and NOu levels was not found. Our study suggests a reduction in the basal NO production confirmed by NOu analysis in subjects with the 90 kDa N-domain ACE isoform alone or associated with a family history of hypertension. Our data suggest that the presence of the 90 kDa N-domain ACE itself may have a negative impact on flow-mediated dilatation stimulated by reactive hyperemia. Nitric oxide (NO) is not just a vasodilator, but has several critical roles in the maintenance of vascular homeostasis (1). NO and Angiotensin II (AII) antagonize each other in many vascular functions, such as cell growth, apoptosis, and inflammation. AII has a central role in the generation of oxidative stress in the vessel wall (2). An increased activity in the reninangiotensin system (RAS) has been shown to be related closely to endothelial cell (EC) dysfunction. Studies demonstrated that a reduction in AII production by ACE inhibitors restores EC function and decreases cardiovascular events in high-risk patients (3,4). Angiotensin I-converting enzyme (ACE, peptidyl dipeptidase A, EC 3.4.15.1, kininase II) is a zinc metalopeptidase that catalyzes the formation of AII and participates in vascular tonus regulation and water and sodium homeostasis (5,6). ACE is a major link between RAS and the kinin system, because it not only converts AI to AII but also inactivates bradykinin (5,7). ACE is found as a membrane-bound enzyme anchored by the hydrophobic carboxyl-terminal segment and as a circulating molecule in body fluids and is organized in two homologous domains, (N and C-domain) (8). ACE exists in at least two different forms: somatic and testicular ACE (9,10). ACE also was found in cerebrospinal fluid (11) heart, blood vessels, kidney, and in a freely soluble form in plasma and urine (12,13). Casarini et al. described two ACE isoforms in human urine of normotensive subjects with 190 and 65 kDa and of hypertensive patients with 90 and 65 kDa (both N-domain ACE). Three isoforms with 190, 90, and 65 kDa were found in urine from offspring with family history of hypertension. 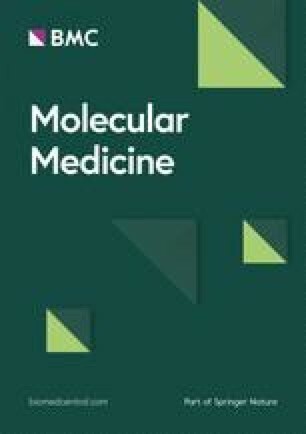 Studies using animal models suggested that the 90 kDa ACE could be a possible genetic marker of hypertension (13, 14, 15, 16). Endothelial dysfunction (ED) is considered an early event in the development of atherosclerosis, and several studies have demonstrated the presence of ED in hypertensive patients (17). Basal NO synthesis may be the first detectable evidence of endothelial dysfunction. ED is present in healthy normotensive subjects who are at high risk for the development of essential hypertension (18). Although there is a general agreement that endothelium-dependent vasodilatation is impaired in patients with essential hypertension, the relationship between this defect and plasma concentrations of nitric oxide is unclear (17). Most cardiovascular risk factors have been recognized to promote a proinflammatory state (19). Among them, arterial hypertension has been related to many circulating inflammatory markers such as C-reactive protein (CRP) and homocysteine (Hcy), (20, 21, 22) independently of other risk factors, promoting the idea of hypertension as a potentially pro-inflammatory condition (22). Studies have clearly established that CRP predicts a future risk of cardiovascular disease in apparently healthy people (23). The mechanism linking Hcy with cardiovascular disease may be the induction of vascular damage, although the exact mechanism is not understood fully. On the other hand, some prospective studies have shown only a weak or no relationship between homocysteine and cardiovascular disease (24). Our purpose is to test the hypothesis that the presence of the 90 kDa N-domain ACE form in human urine could be associated with ED and inflammatory markers such as CRP and Hcy in the prediction of an increase in blood pressure levels. This is a cross-sectional study of male normotensive subjects, ranging in age from 18–40 years, with (FH+) and without (FH−) a family history of essential hypertension (EH). A total of 40 healthy male volunteers age ranging from 18–40 years were included in this study. Hypertension was defined as blood pressure levels above 140/90 mmHg. Women were not included in this study due to the protective effect of estrogen that might interfere with our results. None of the subjects had any significant past medical history, nor were they taking any medication or vitamins before or during the study, and all were nonsmokers. The subjects were initially divided into two groups according to the presence or absence of essential hypertension in at least one parent. The next step was based on the presence (+) or absence (−) of the 90 kDa N-domain ACE isoform, irrespective of FH, and finally we combined the presence of FH and the presence of 90 kDa N-domain ACE isoform which was compared with the group where both conditions were absent. This study was conducted in accordance with the Guidelines for Good Clinical Practice and the Declaration of Helsinki after approval by the Ethics Committee on Human Experimentation from the Federal University of São Paulo. Informed consent was obtained from all volunteers. Subjects underwent a physical examination, which included weight and height measurements to determine body mass index (BMI), measurement of waist (W) and hip (H), and combined calculation of their ratio (WHR). Physician investigators measured blood pressure using a mercury column sphygmomanometer and a cuff of appropriate size. The standardized protocol involved measurement of systolic and diastolic blood pressures in the left arm after participants had been seated quietly for 5 min, at intervals of 1 min for 3 min. The heart rate (HR) also was measured. A mean of these BP values was used for further analyses. Biochemical profile was determined from blood samples collected after a 12 h overnight fast. Those who presented with any laboratorial abnormality were excluded from the study. Afterward, they were scheduled for a brachial artery reactive test to evaluate FMD. The urine was concentrated in Centricon concentrator (Millipore, Billerica MA, USA) and dialyzed in the same equipment against 50 mmol/L Tris-HCl, pH 8.0, containing 150 mmol/L NaCl using a 30 kDa molecular weight exclusion membrane. The concentrated urine (1.0 mL) was submitted individually to a gel filtration on an AcA-44 column (16 × 840 mm) previously calibrated with standard proteins (Amersham Pharmacia Biotech, San Francisco CA, USA). Fractions (1.0 mL) were collected at a flow rate of 20 mL/h. Protein concentration was monitored by absorbance at 280 nm and ACE activity was measured using Z-Phe-His-Leu (Z-PheHL) as substrate (25,26). 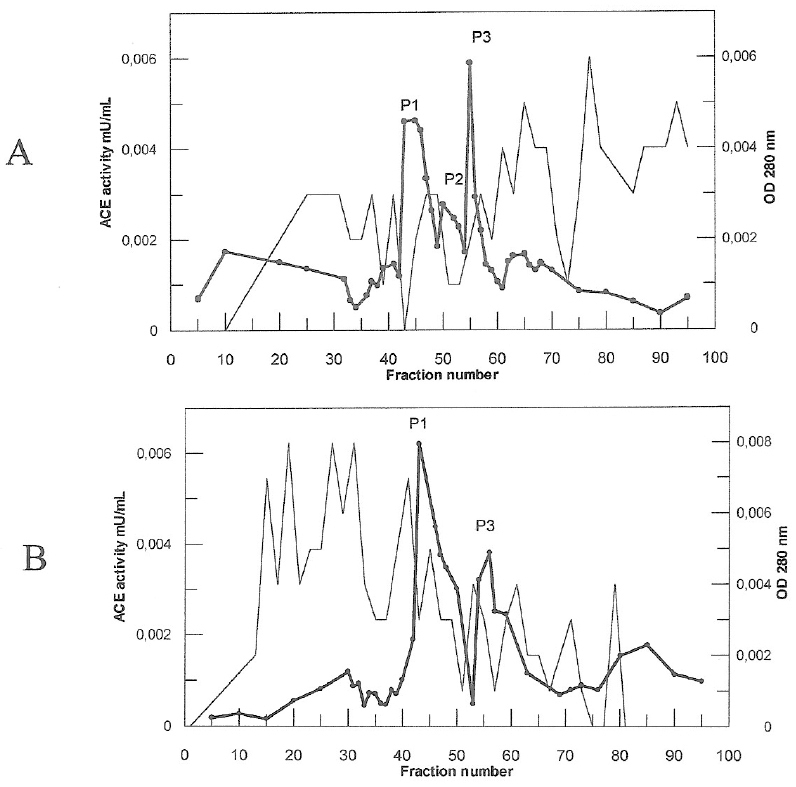 The protein levels of urine and purified enzymes were determined by the Bradford method (Bio-Rad Protein Assay, Hercules CA, USA) using bovine albumin as standard, except when absorbance at 280 nm was used for chromatographic elution profile (27). 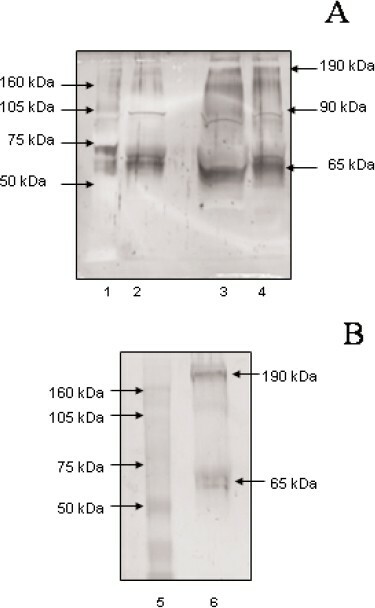 Western blotting was performed using 100 µg of urinary protein. SDS-PAGE was performed as described by Laemmli (28). After the electrophoretical transference of the proteins from the polyacrylamide gel to a nitrocellulose membrane (Hybond P, Amersham Biosciences, Piscataway NJ, USA) it was incubated overnight at room temperature with antibody Y4 diluted 1:1000 (29). The secondary antibody was an anti-rabbit Ig (Whole Ab) (GE Healthcare, Vppsal, Sweden). Subsequent steps were carried out using the biotin/streptavidin system (Amersham Pharmacia Biotech, Vppsal, Sweden) as recommended by the manufacturer. The endothelial function test was performed by high-resolution B-mode ultrasound images using a non-invasive methodology described by Celenmajer et al. (30). The equipment used in this study was an Ultramark HDI 3000 (ATL ultrasound incorporation), with a linear transducer of L7-4 MHz. Examinations were performed in an air-conditioned room at a temperature of ∼22° C. To avoid circadian variations, all examinations took place in the morning. This test assessed FMD after reactive hyperemia. Diameter and blood flow velocities were determined in triplicate. The maximum blood flow (mL/min) was determined in the first 15 s after cuff release. Ninety seconds after ischemia, three measurements of the diameter of the brachial artery were taken during the diastole period. FMD response was expressed as the change in end-diastolic diameter of the brachial artery during reactive hyperemia compared with the baseline measurement and used as a measure of endothelium-dependent vasodilatation. Concentrations of plasma homocysteine levels were measured by high performance liquid chromatography (HPLC, Shimadzu, Kyoto, Japan) with a column Prodigy ODS2, 150 × 3.2 mm × 5 µm (Phenomenex, Torrance, CA, USA) as described by Pfeiffer et al. (31) and adapted by Nunes et al. (32). The NO was determined in urine by the chemiluminescence method as described by Ribeiro et al. (33). We used the Model 280 Nitric Oxide Analyzer (NOA) (Sievers Instruments Inc., Boulder, CO, USA). The sensitivity for measurement of NO and its reaction products is approximately 1 picomole. Concentrations of plasma C-reactive protein levels were measured by a chemiluminescence method with an automated IMMULITE system. Data were expressed as mean ± standard deviation (SD). Urinary nitric oxide concentrations were transformed logarithmically to normalize the distribution. The unpaired Student t-test or analysis of variance (ANOVA) were used, as appropriate, to compare means of continuous variables. Correlation between variables was assessed by the Pearson’s correlation coefficient. Linear regression analysis was performed considering % FMD as the dependent variable, and as independent variables: age, BMI, lipid profile, CRP, Hcy, and NOu. A P value < 0.05 was used to indicate statistical significance. Statistical analyses were performed using the SPSS software (SPSS 10.1 for Windows, USA). Clinical, biochemical, and demographic characteristics of subjects were divided according to presence (FH+, n = 26) or absence (FH−, n = 14) of family history of high blood pressure. There was no statistically significant difference between these two groups (data not shown). The urine samples of subjects were submitted to DAE-cellulose chromatography. Three peaks with ACE activity were detected in subjects with family history of hypertension with molecular weight of 190, 90, and 65 kDa and two peaks with 190 and 65 kDa in subjects without family history of hypertension (Figures 1A,B). The urine was studied by Western blot analysis using the antibody (Y4) raised against human kidney ACE (Figure 2A,B). The same subjects were divided into other groups according to presence (90 kDa+, n = 33) or absence (90 kDa−, n = 7) of the N-domain ACE, and according to presence or absence of family history of hypertension plus presence or absence of the enzyme, FH+/ACE90+ (n = 23) and FH−/ACE90− (n = 4), respectively (Table 1). A family history of high blood pressure was reported in 65% of subjects and the 90 kDa N-domain ACE isoform was detected in 82%. The ACE activity in the urine of subjects with 90 kDa ACE isoform tended to be higher than in subjects without this isoform (0.37 ± 0.37 compared with 0.27 ± 0.26 mU/mg, respectively). The same profile was found in the FH+/ACE90+ group (0.41 ± 0.37 mU/mg) compared with FH−/ACE90− group (0.2 ± 0.2 mU/mg). 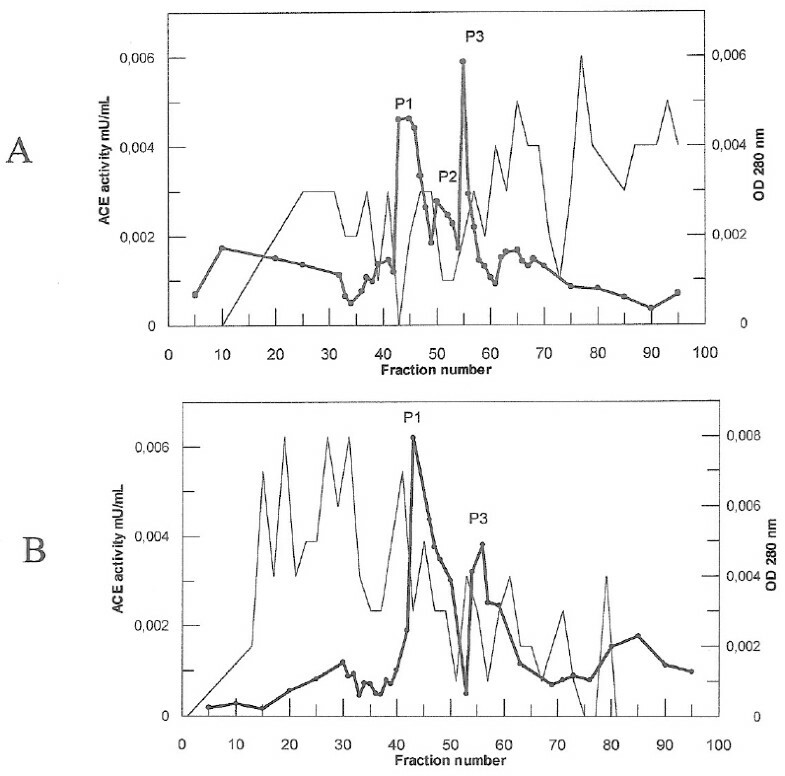 Gel filtration chromatography of human urine: 1.0 mL of concentrated urine from normotensive subjects (A): with family history of hypertension (FH+) and (B): without family history of hypertension (FH−) were submitted separately to gel filtration on an AcA-44 column equilibrated and eluted as described in the Methods section. Fractions of 1.0 mL were collected at a flow rate of 20 mL/h; (—) Optical Density (OD) 280 nm; (—) ACE activity on Z-PheHL as substrate. Western blotting analysis of urine; Expression analysis of urinary proteins was done with the use of Y4 polyclonal anti-ACE antibody. (A); Normotensive subjects with family history of hypertension (FH+); Lane 1 standard (Rainbow, Amersham Biosciences, Sweden) 2, 3, and 4, urine from three different subjects FH+. (B); Lane 5 standard (Rainbow, Amersham Biosciences, Sweden), lane 6, subject without family history of hypertension (FH−). Arrows indicate bands recognized by the antibody and the standards. Clinical characteristics of the studied subjects from the different groups. aBMI indicates body mass index. bTotal Cholesterol, Triglycerides, HDL-C and LDL-C (mmol/L). cUrinary nitric oxide indicates NOu-µM (log). The results of baseline blood flow were analyzed and there were no statistically significant differences between the groups studied (data not shown). We found no statistically significant differences between baseline vascular diameter of the subjects. These results were: 0.39 ± 0.04 in ACE90+ compared with 0.38 ± 0.05 cm in ACE90− group and 0.39 ± 0.04 in FH+/ACE90+ compared with 0.38 ± 0.04 cm in FH−/ACE90−. We found an impaired endothelial dilatation in subjects who presented the 90 kDa N-domain ACE as follows: 11.4% ± 5.3% in ACE90 + compared with 17.6% ± 7.1% in ACE90− group, P < 0.05, and 12.4% ± 5.6% in FH+/ACE90+ compared with 17.7% ± 6.2% in FH−/ACE90− group, P < 0.05 (Figure 3). These results of FMD correspond to lower urinary nitric oxide concentrations in the groups that have impaired endothelial function. The values of log (NOu) were 6.8 ± 0.8 in ACE90+ and 7.2 ± 0.5 µM in ACE90− group. For the groups FH+/ACE90+ and FH−/ACE90−, the corresponding values were, respectively, 6.9 ± 0.9 compared with 7.2 ± 0.5, which were not found statistically significantly different. Percentage of flow-mediated dilatation (FMD) in subjects with ACE 90 kDa (ACE 90 kDa+), without this isoform (ACE 90 kDa−); subjects with family history of hypertension and the 90 kDa isoform (FH+/ ACE 90 kDa+), and subjects without these two variables (FH-/ACE 90 kDa−). *P < 0.05. The homocysteine levels were lower in the ACE 90 kDa+ than in the ACE 90 kDa− group (9.9 ± 2.6 µM compared with 11.4 ± 2.8 µM), and the comparison reached statistical significance between the groups FH+/ACE90+ and FH−/ACE90− (10.0 ± 2.3 µM compared with 12.7 ± 1.5 µM, P < 0.05). The same profile was found for CRP levels, the values were lower in the ACE 90 kDa+ than in the ACE 90 kDa− group (1.3 ± 1.7 mg/L compared with 2.3 ± 2.2 mg/L). The levels were significantly lower in the FH+/ACE90+ than in the FH−/ACE90− group (1.3 ± 1.8 mg/L compared with 3.6 ± 2.0 mg/L, P < 0.05). We did not detect any statistically significant association between FMD and inflammatory markers, or between FMD and NOu. In the present study, we investigated the association of urinary 90 kDa ACE N-domain isoform and CRP, Hyc plasma levels, urinary nitric oxide, and endothelial dysfunction in healthy subjects with or without a family history of hypertension. The differences between all groups studied for clinical data, biochemistry, and demographics were not statistically significant. A family history of high blood pressure was found in 65% of the subjects and the 90 kDa ACE isoform was detected in 82% of the subjects. The presence of 90 kDa isoform was not found in all subjects with a history of high blood pressure, this may be because the family giving information is subjective or that the genetic alterations responsible for inherited essential hypertension remain largely unknown (34). We found three ACE isoforms with 190, 90, and 65 kDa in the urine of offspring with a family history of hypertension, but in subjects without family history of high blood pressure, only two isoforms with 190 and 65 kDa. The presence of 90 kDa ACE isoform was analyzed by gel filtration chromatography and confirmed by Western blotting. This result is in agreement with our previous study where 90 kDa N-domain ACE was reported to be segregated and may be a very important factor in the conversion of a normotensive subject to hypertensive, and also was related to hypertension in a crossing and retro-crossing of Spontaneously Hypertensive and Brown Norway rats (13, 14, 15, 16). The presence of 90 kDa and 65 kDa ACE has been the target of several studies. The literature suggests that mechanisms of solubilization are involved in forming these isoforms by shedding with a secretase or (35, 36, 37), by an alternative splicing of the ACE mRNA (38,39). Patients with the ACE90 kDa+ had a significantly reduced endothelium-dependent vasodilatation response of the brachial artery when compared with patients without this isoform (ACE 90 kDa−): 11.4% ± 5.3% compared with 17.6% ± 7.1%, P = 0.014, respectively. Patients with 90 kDa ACE associated with a family history of hypertension also had a negative impact on FMD and the percentage was: 12.4% ± 5.6% in FH+/ACE90+ compared with 17.7% ± 6.2% in FH−/ACE90− group (P < 0.05). The data of Taddei et al. (40) indicated that Ach-mediated forearm vasodilatation is reduced in normotensive subjects with a family history of essential hypertension, a finding that suggests that endothelium dysfunction can precede the appearance of hypertension, and that this abnormality might play a role in pathogenesis of hypertension. An impaired trend was observed in relation to NOu, where subjects with 90 kDa ACE had a lower urinary nitric oxide concentration than those who did not have this isoform (6.8 ± 0.8 compared with 7.2 ± 0.5 log µM, respectively). In relation to the groups FH+/ACE90+ and FH−/ACE90−, these concentrations were 6.9 ± 0.9 compared with 7.2 ± 0.5 respectively. Although no statistically significant difference was found in relation to NOu, these findings are compatible with the ultrasound results. There is a general agreement that endothelial-dependent vasodilatation is impaired in patients with essential hypertension (17,41), but the relationship between this defect and plasma concentrations of nitric oxide is not clear. Our results agree with Lyamina et al. (42) who showed that 24 h urinary excretion of Nox was significantly lower in patients with stage I and II hypertension than in control subjects, and significantly lower in patients with stage II hypertension than in patients with stage I hypertension. ACE catalytic activity was determined using Z-Phe-His-Leu as substrate described as a specific substrate to N-domain ACE portion (37). Subjects with 90 kDa ACE isoform had higher enzymatic urinary activity when compared with the group without the 90 kDa ACE. The same tendency was observed in the group that had this isoform associated with a family history of high blood pressure, suggesting that subjects who have ACE 90 kDa may be more susceptible to hypertension (15). Examination of lipidic profile showed that the group with 90 kDa isoform had higher triglyceride levels than the group without the urinary isoform, as shown in results. When we analyzed the presence of 90 kDa ACE associated with a history of hypertension (FH+/ACE90+ and FH−/ACE90− groups), we found the same profile without a statistically significant difference. HDL-C levels were lower in subjects with 90 kDa ACE isoform than in those without it being similar to the results obtained for subjects with FH+/ACE90+ compared with FH-/ACE-. This difference was not statistically significant, but may suggest that patients with 90 kDa ACE isoform could have a major risk of developing atherosclerosis. There was no significant correlation between FMD, CRP, and homocysteine levels in any of the subjects studied. The study of Chrysohoou et al. (22) revealed differences in the markers, such as CRP and homocysteine, between prehypertensive and normotensive subjects without any clinical evidence of cardiovascular disease. They found homocysteine levels higher in prehypertensive (13.9 µM) and hypertensive (14.1 µM) compared with normotensive subjects (13.1 µM). They hypothesized about a direct relationship between borderline blood pressure levels and inflammation process. We did not detect a relationship between BP and Hcy. The highest value found was 12.7 µM, which is not considered hyperhomocysteinemia by Refsum et al. (43). The analysis of our results shows that subjects with 90 kDa ACE had Hcy levels lower than those who did not have this isoform. This finding was not statistically significant. Instead, the analysis of the presence of an urinary isoform associated with a history of high blood pressure presents a statistical difference between the groups FH+/ACE90+ and FH−/ACE90−. We cannot suggest a correlation between Hcy and 90 kDa ACE. The CRP levels detected in all groups studied do not have any correlation with the presence of 90 kDa ACE isoform. According to Clapp et al. (44), the enormous range of CRP levels in vivo argues strongly against this CRP having a major role in the modulation of vascular tone. In conclusion, our data indicated that reduced endothelial vasorelaxant properties shown in 90 kDa N-domain ACE subjects can be detected prior to the onset of high blood pressure. This finding might suggest a primary endothelium defect allied to the presence of 90 kDa N-domain ACE isoform and higher levels in its urinary activity that can play a role in the pathogenesis of essential hypertension. In summary, our findings suggested that subjects with the 90 kDa ACE with a family history of hypertension presented endothelial dysfunction under sub-clinical conditions. These data support the premise that these parameters antedate the onset of hypertension. The predictive value of these possible biomarkers (for example, 90 kDa N-domain ACE and endothelial dysfunction) could be used for assessing future hypertension risk. Studies with a large population would be necessary to use these biomarkers for predicting hypertension, which is considered a critical public health problem. This study was supported by FAPESP (2002/13290-2 and 2004/11149-6), We thank Vania D’Almeida, Margaret Gori Mouro, and Luciana Cristina Teixeira for their technical assistance. Thank you also to François Alhenc-Gelas, Unité 367, INSERM, Paris, France, for the kind gift of antibody Y4.